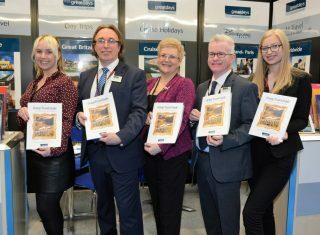 Greatdays Travel Group has launched its 2019 Group Travel Guide at the recent British Travel Trade Show (BTTS) in Birmingham. The guide features an enhanced European section aimed at making it easier for coach tour operators and group travel organisers to read. The changes see the introduction of a new day-by-day format for the European section, enhanced European tour itineraries, 16 new UK tours and 14 new tours in London and the surrounding area. Following the introduction of more flights from UK regional airport, more European tours are now being offered with the option of air travel. The UK section of the guide features 16 new tours for 2019. These include ‘Train, Temple and a Tipple’, offering the opportunity to visit Conishead Priory, a Buddhist temple in the Lake District, to view the historic house and enjoy afternoon tea. ‘Beer and a Balti’ combines a Balti cooking masterclass in Birmingham with a brewery tour while ‘Ladies’ Delight’ combines shopping at Bicester Village with a visit to Bombay Sapphire. In Northern Ireland, ‘Rediscover Ireland’ includes a visit to Castle Ward in County Down, the location of ‘Winterfell’ in the TV series Game of Thrones. The guide also features 14 new London tours. These include ‘The Romans in London’, giving groups a snapshot of life back in Roman Times. The tour, hosted by a Blue Badge Tourist Guide, includes a visit to the British Museum and the Museum of London. Prices start at £55 per person for one night’s accommodation with breakfast. ‘Bibles Boats and Bulrushes’ is a new two-night tour in Hertfordshire that includes a look at a Norman Church, reputed to be the burial place of King Harold, lunch in a riverside pub, and a two-and-a-half-hour cruise along the River Lee to the market town of Ware. 4-star hotel accommodation, the canal cruise and the services of a local guide start at £159 per person. Linking in with the trend for more experiential tours, the guide also features many of the UK’s annual events. The highlight is Kynren, a 90-minute spectacular set against the backdrop of Auckland Castle in County Durham that takes audiences on a journey through 2,000 years of British history, myth and legend at breakneck speed. To obtain your free copy of the Greatdays Travel Guide 2019, visit our Brochure Request page. Photo L-R: Katharine Worsley, Paul Beaumont, Gina Halden, Martin Slater and Chloe Ridley.